The Province of East Prussia (German: Provinz Ostpreußen ) was a province of Prussia from 1773–1829 and 1878–1945. Composed of the historical region East Prussia, the province's capital was Königsberg (present-day Kaliningrad). East Prussia was formed in 1773 out of the territory of the former Duchy of Prussia, a Polish vassal state, which upon the death of Duke Albert Frederick in 1618 fell to his Hohenzollern relative Elector John Sigismund of Brandenburg. From that time the Imperial Margraviate of Brandenburg and Polish Ducal Prussia were ruled in personal union. During the Second Northern War, on 19 September 1657, the "Great Elector" Frederick William of Brandenburg concluded the Treaty of Wehlau with the Polish king John II Casimir Vasa, according to which the Polish Crown renounced its suzerainty over the Prussian duchy. The Brandenburg sovereignty was acknowledged in the 1660 Peace of Oliva; it enabled Frederick William's successor Elector Frederick III to crown himself a "King in Prussia" at Königsberg in 1701 without consent of the Holy Roman Emperor. In the 1772 First Partition of Poland, the Prussian king Frederick the Great annexed neighboring Royal Prussia, i.e. the Polish voivodeships of Pomerania (Gdańsk Pomerania or Pomerelia), Malbork, Chełmno and the Prince-Bishopric of Warmia, thereby bridging the "Polish Corridor" between his Prussian and Farther Pomeranian lands and cutting remaining Poland off the Baltic Coast. The territory of Warmia was incorporated into the lands of former Ducal Prussia, which, by administrative deed of 31 January 1773 were named East Prussia. 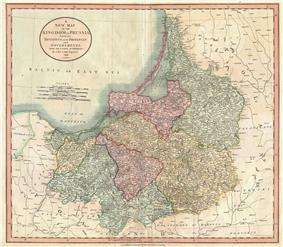 The former Polish Pomerelian lands beyond the Vistula River together with Malbork and Chełmno Land formed the Province of West Prussia with its capital at Marienwerder (Kwidzyn). The Polish Partition Sejm ratified the cession on 30 September 1773, whereafter Frederick officially went on to call himself a King "of" Prussia. After the disastrous defeat of the Prussian Army at the Battle of Jena-Auerstedt in 1806, Napoleon occupied Berlin and had the officials of the Prussian General Directory swear an oath of allegiance to him, while King Frederick William III and his consort Louise fled via Königsberg and the Curonian Spit to Memel. The French troops immediately took up pursuit but were delayed in the Battle of Eylau on 9 February 1807 by an East Prussian contingent under General Anton Wilhelm von L'Estocq. Napoleon had to stay at the Finckenstein Palace, but in May, after a siege of 75 days, his troops led by Marshal François Joseph Lefebvre were able to capture the city Danzig, which had been tenaciously defended by General Count Friedrich Adolf von Kalkreuth. On 14 June, Napoleon ended the War of the Fourth Coalition with his victory at the Battle of Friedland. Frederick William and Queen Louise met with Napoleon for peace negotiations, and on 9 July the Prussian king signed the Treaty of Tilsit. 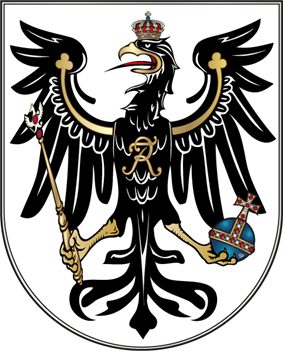 As a result of World War I, the Hohenzollern monarchy of the Kingdom of Prussia was abolished in 1918, and the kingdom became the Free State of Prussia. After the Treaty of Versailles, East Prussia was separated from Germany as an exclave; the Memelland was also separated from the province. Because most of West Prussia became part of the Second Polish Republic as the Polish Corridor, the formerly West Prussian Marienwerder region became part of East Prussia (as Regierungsbezirk Westpreußen). Also Soldau district in Allenstein region was part of Second Polish Republic. Erich Koch headed the East Prussian Nazi party from 1928. He led the district from 1932. This period was characterized by efforts to collectivize the local agriculture and ruthlessness in dealing with his critics inside and outside the Party. He also had long-term plans for mass-scale industrialization of the largely agricultural province. These actions made him unpopular among the local peasants. However, through publicly funded emergency relief programs concentrating on agricultural land-improvement projects and road construction, the "Erich Koch Plan" for East Prussia allegedly made the province free of unemployment; on August 16, 1933 Koch reported to Hitler that unemployment had been banished entirely from East Prussia, a feat that gained admiration throughout the Reich. Koch's industrialization plans led him into conflict with R. Walther Darré, who held the office of the Reich Peasant Leader (Reichsbauernführer) and Minister of Agriculture. Darré, a neopaganist rural romantic, wanted to enforce his vision of an agricultural East Prussia. When his "Land" representatives challenged Koch's plans, Koch had them arrested. Following Nazi Germany's defeat in World War II in 1945, East Prussia was partitioned between Poland and the Soviet Union according to the Potsdam Conference. Southern East Prussia was placed under Polish administration, while northern East Prussia was divided between the Soviet republics of Russia (the Kaliningrad Oblast) and Lithuania (the constituent counties of the Klaipėda Region). The city of Königsberg was renamed Kaliningrad in 1946. The German population of the province largely evacuated during the war, but several hundreds of thousands died during the years 1944–46 and the remainder were subsequently expelled. ^ Dan P. Silverman (1993). "Fantasy and Reality in Nazi Work-Creation Programs, 1933-1936". The Journal of Modern History 65 (1): 113–151.